Since Oxagile’s foundation in 2005, we’ve kept a steady focus on real-time communication, enabling our clients to improve employee productivity. In 2012, WebRTC had us at hello with its promise of free, ubiquitous, in-browser communication. Today, the technology has grown into its potential, empowering Oxagile to build cost-effective, easily deployable products for clients across multiple business domains. Video conferencing is one of the core applications for WebRTC. 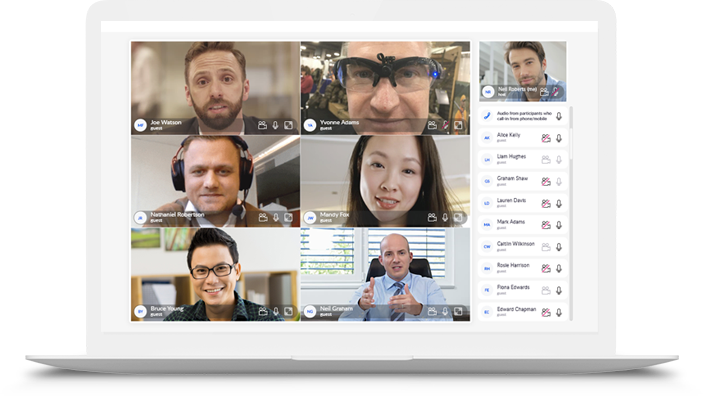 The technology allows easily starting a video chat in almost any modern browser — with no hassle or security risks of installing extra software or third-party plugins. Over the years, Oxagile has accumulated a wealth of expertise in developing comprehensive WebRTC-based conferencing solutions featuring video and voice messaging, desktop sharing, file exchange capabilities, co-browsing, and more. Based on our experience, we typically recommend one of the two ways of implementing a powerful WebRTC-based solution: by relying on a third-party CPaaS (Communications Platform-as-a-Service) or by building a custom infrastructure. A third-party platform (such as TokBox or Vidyo) allows for lower development costs, shortens time to market, and takes away the maintenance burden. On the other hand, a custom infrastructure ensures flexibility, saves money on operation costs, and leaves full control of the system in your hands. Whatever the approach, we have the skills and know-hows to make it work for your particular business case. Sales is all about customer loyalty. Win it by implementing personalized video and audio consultations into your website or app and bringing your support team closer to online clients. Harness the latest telehealth technology to deliver high-quality, value-based care. From emergency stroke treatment to post-operative follow-ups, reach your patients wherever they are and whenever they need it. Innovate your customer approach and improve your Net Promoter Score with video banking capabilities. WebRTC tech uses voice and video encryption and eliminates risks of accidental malware installation, so that virtual conversations are always protected from eavesdropping. Build intuitive video conferencing and collaboration tools integrated into your e-Learning product. Think screen and whiteboard sharing, seamless file and data exchange, and more — to make tutor-student interactions more engaging and efficient. Check out the unique business challenges we have solved for the world’s leading companies. We synergized our multi-year WebRTC expertise to dive deep into each projects’ specifics and achieve measurable business results. Oxagile has proven to be very efficient and professional with supreme attention to detail. Their technical knowledge and WebRTC expertise have been excellent and they manage their time well. The work Oxagile has completed for us has been very high quality and we have depended on them for many internal projects that were critical to our service. Have an idea for a project? Get in touch with our WebRTC development team for expert advice on how to put it in motion!